Beautiful dahlias like these are easy to grow. Dahlias are great for beginning gardeners. It's easy to grow beautiful dahlias with no experience. With dahlias, it's location, location, location. Dahlias grow most happily in full sun, although they'll tolerate partial shade. Large-flowered varieties need protection from wind, so try to plant your dahlias where there's a windbreak if your area is windy. To grow successfully, dahlias need a site with fertile, well-drained soil. Because their main root structures are tubers, they are susceptible to rot when the roots are in soil that retains too much water. If your soil is heavy or clay-ish, don't despair; you can probably amend it with a little shovel work. 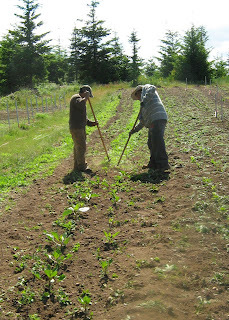 Andy and the gang prepare trenches for dahlias. Dahlia plant size varies according to bloom size; dahlias with giant and medium-sized blooms should be planted about three feet apart (or three feet from other plants in a mixed bed), while small, miniature and pompon dahlias can be planted two feet apart. 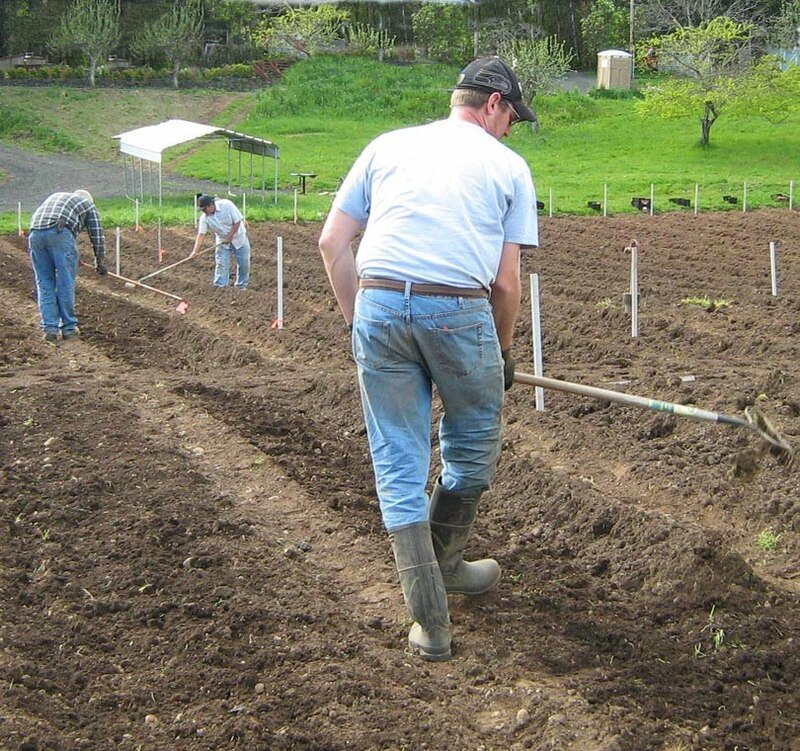 If your soil is heavy or clayish, spade in sand and peat, composted wood shavings, or other high-fiber material. If your soil is sandy and lacks fertility, add mushroom compost, composted chicken or steer manure, worm castings, or well-finished compost from your compost pile. Two to three feet apart and eye up! Dig holes or trenches a foot deep. Line with good soil (see above) to support your dahlias' fast growth habits. If you wish, you can add commercial fertilizers with a 5-10-10 or 10-20-20 makeup, although many growers recommend sticking to organic garden practices with dahlias. 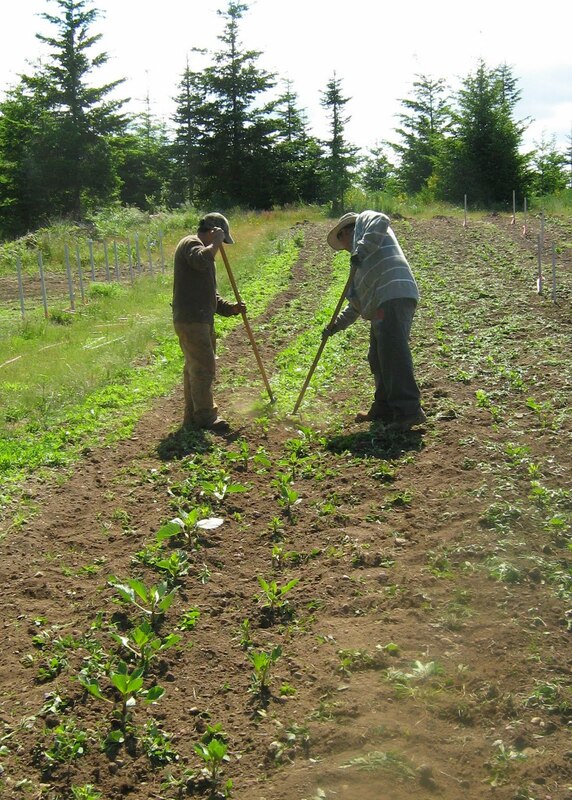 Depending on the size of the plant, you'll be planting your tubers between 4" and 6" deep. Plant dahlia tubers after the danger of frost is past. In most areas that's between April and mid-June. Locate the "eye" on each tuber (it will look like the eye on a potato, and may even have begun to sprout a bit.) 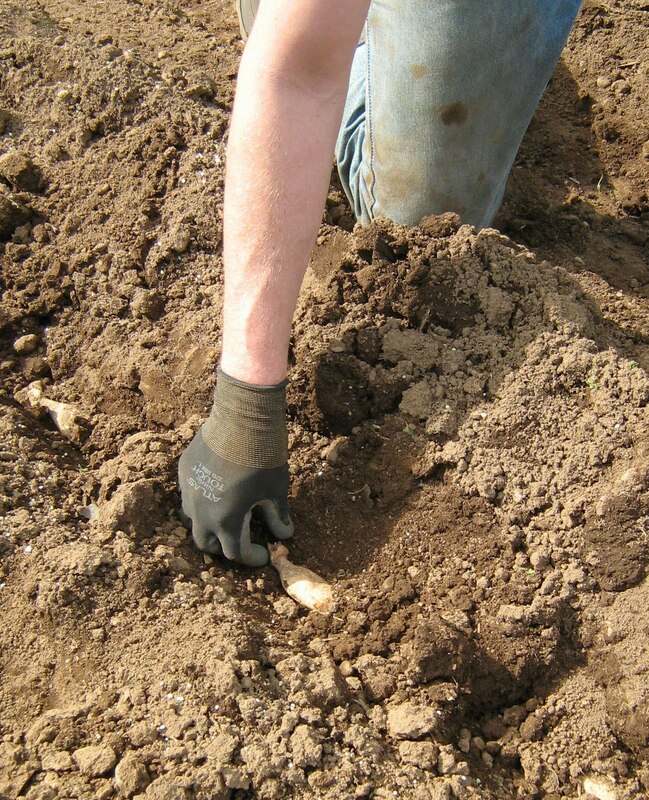 Place the tubers in the soil horizontally, with the eyes facing upwards. 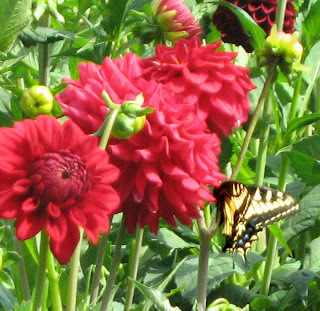 Dahlias are shallow feeders with many roots near the surface of the ground, so it's necessary to keep the row or flower bed weed free to avoid stunting the growing dahlia plant. (After the plants near full size, they will shade out any competing weeds and you can be a little less vigilant about weeds.) It's best to pull the weeds or use a very shallow hoe or cultivator to avoid interfering with your dahlias' root systems. Protect your emerging dahlias from pests like snails, slugs and earwigs, too. You can bait slugs with beer wells or organic or chemical baits, go after them with stabbers or ammonia spray (salt is effective but not good for your garden), or try to use barriers like heavy layers of eggshells or copper strips. Organic soaps and neem are sometimes effective against insect damage. Water very sparingly until the dahlias begin to bloom. It's hard to wait, but before you know it your dahlias will reward you with beautiful blossoms.